(VEN) - As the first summit between ASEAN and a partner country since the formation of the ASEAN Community, the recent ASEAN-US Leaders Summit was an opportunity for the parties to discuss issues related to the East Sea and the Trans-Pacific Partnership (TPP). It also provided an opportunity for the US and Vietnam to realize its strategic partnership. 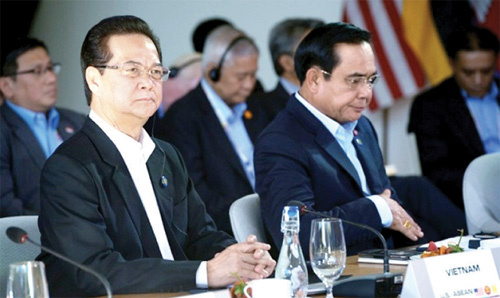 The summit taking place between February 15 and 16 was seen as a new milestone in the ASEAN-US strategic partnership, representing ASEAN’s role and improved international position as well as the desire of ASEAN member countries in promoting economic cooperation, maintaining high growth, protecting regional peace and security and supporting ASEAN’s central role. Regarding the development of regional prosperity through innovation and entrepreneurship at the opening session of the ASEAN-US Leaders Summit, the meeting discussed economic and trade issues with a focus on implementing the TPP with the participation of four ASEAN members including Singapore, Brunei, Malaysia and Vietnam. A number of other ASEAN members such as Thailand and Indonesia also expressed its intention to join the agreement. Vietnamese Prime Minister Nguyen Tan Dung said that as an active and responsible ASEAN member, Vietnam has made great efforts in forming the ASEAN Community and ensuring prosperity in the region. After 30 years of innovation, Vietnam has gained many important achievements in socioeconomic development, contributing to ensuring economic growth associated with social justice. In the next period, Vietnam will promote reforms in addition to actively implementing international integration policies and participating in economic links in different levels. In particular, the ASEAN Economic Community, the Asia-Pacific Economic Cooperation, the TPP and the Regional Comprehensive Economic Partnership will be the key frameworks. Emphasizing the strategic importance of ASEAN-US relations to peace, stability and development of the region, Prime Minister Nguyen Tan Dung suggested that the two sides effectively implement agreed cooperation programs, particularly the ASEAN-US Action Plan for the 2016-2020 period, promote investment, share start-up experience and strengthen technology transfer between enterprises. He also proposed the establishment of the ASEAN-US Center to support start-up and promote the development of small and medium-sized enterprises in Vietnam. The ASEAN-US Leaders Summit provided opportunities for not only leaders to discuss important issues but also enterprises to seek partners. In the framework of the summit, the Joint Stock Commercial Bank for Investment and Development of Vietnam (BIDV) and some Vietnamese enterprises signed cooperation agreements with US companies such as life insurance trading in Vietnam. The two sides agreed on cooperation contents mainly including promoting information and experience exchanges and introducing opportunities to strengthen cooperation between the two sides in finance and insurance. The Bien Dong Seafood Co., Ltd. signed a contract with the H2Origins Seafood, Inc. to supply seafood products. The two sides will promote cooperation to increase market share in the US market, share market development information and jointly develop new seafood products with the best quality in order to achieve growth in sales of US$300 million over the next 36 months. The Thai Group signed a contract to build the Park Hyatt brand in Vietnam with the Hyatt Hotels Corporation. The two sides agreed on building a US$165-million Park Hyatt hotel in Hanoi with nearly 300 suites and presidential suites. The project is expected to be completed by 2018. Prime Minister Nguyen Tan Dung also had a number of bilateral meetings with leaders of ASEAN countries. Addressing a meeting with Thai Prime Minister Prayuth Chan-ocha, he highly appreciated close guidance in promoting labor cooperation between the two countries as well as the registration and licensing for Vietnamese laborers in Thailand. He suggested that the two sides should coordinate better to implement the Memorandum of Understanding on labor cooperation and the agreement on labor recruitment signed in July 2015. In a bilateral meeting with Indonesian President Joko Widodo, the two leaders agreed to strengthen economic and investment cooperation, persify products in trade activities and closely cooperate in addressing issues related to Vietnamese fishermen and fishing vessels. Thanks to a series of meaningful activities at the macro level between leaders and the micro level among enterprises, the ASEAN-US Leaders Summit was seen as a historical event, contributing to promoting economic cooperation between ASEAN and the US in general and between the US and Vietnam in particular in a context where the TPP was signed.